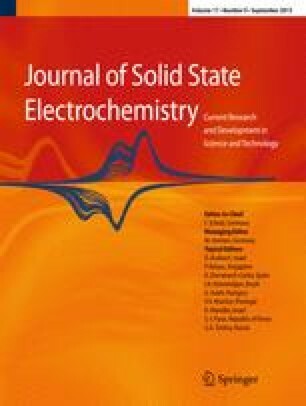 LiCoPO4 samples were synthesized by two different techniques (high-temperature solid-state reaction and lower-temperature synthesis using NH4CoPO4·H2O as precursor) and tested as cathode materials for 5-V lithium batteries. An irreversible lithium deinsertion was observed for the high-temperature sample. In contrast, the application of lower-temperature synthesis led to a significant improvement of the lithium storage reversibility. Different delithiation mechanisms in LiCoPO4 were found for the samples obtained by different synthetic techniques. The nature of capacity fading during cycling of the cells is discussed. This work was supported by the Deutsche Forschungsgemeinschaft (DFG) in the frame of SFB 595. The authors thank Andreas Adams for providing SEM images of the samples.